Mobile is located on the Avalon Peninsula of the province of Newfoundland and Labrador, 32 km along Highway 10 south of the Village Mall in St. John's. Mobile is 10 km south of the town of Bay Bulls, between the town of Witless Bay and the community of Tors Cove, on the shores of Mobile Bay, and in the Mobile River valley. 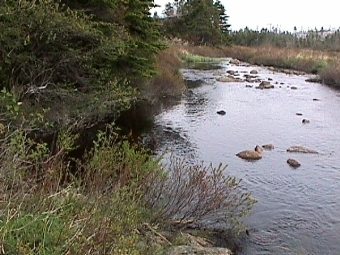 Mobile is situated between the boundaries of the Avalon Wilderness Reserve and the offshore seabird sanctuary in the Witless Bay Ecological Reserve. Mobile can be accessed by going south off Highway 13 (the Witless Bay Line) after exiting the Trans Canada Highway. paved side roads (Cod Seine Cove Road, Gus O'Reilly's Road, Steve O'Reilly's Road, Ambrose Carey's Road, Mill Road, The Track, and Riverhead Road). Gravelled Mobile Road travels into the country to the west off Highway 10 to numerous summer cabins, Mobile First Pond and Mobile Big Pond. Mobile Bay is a fairly large (about 2.7 km long and 3 km wide at the mouth), rough-at-times, deep (about 40 metres at the mouth) bay, open to the east and southeast. 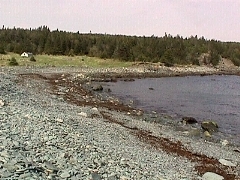 The bay's shorelines are rocky and mostly steep with a cobble beach north of the river estuary. 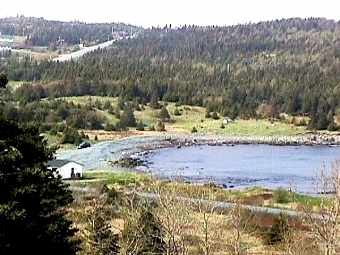 Cleared fields and pastures, and a well-developed trail (now part of the East Coast Trail) are found along both the north and south sides of the bay. Foundations of settler houses and fishing rooms can be found along the shoreline. A small, flat area along Mobile River inland from the beach contains about half of the residential homes with the remainder along Highway 10 and on the hills on either side of the bay and river valley. Mobile appears on early 17 th century navigation charts (as Mommables) and appears to have been inhabited throughout the 18 th century, although, like other Southern Shore communities, continuous settlement dates from the early 1800's. Mobile was a fishing and farming community until Confederation. In 1951, a 9.5 megawatt hydro-electric generating plant was constructed on the Mobile River and since then the community has become less reliant on fishing and farming. 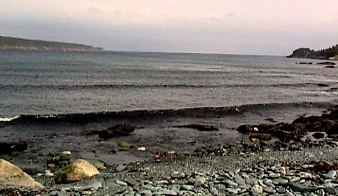 Many people now work in St. John's and surrounding areas, including the offshore. Some of the older Mobile family names are Blackler, Dillon, Fitzgerald, Hutchings, Maher, and Kennedy. Mobile Bay is famous for its humpback and minke whale sightings. From early summer to late fall, pods of both whales frequent the bay and other species visit from time to time. Whales can be viewed from shore and, from the steep sides of the bay, sometimes even closer than is possible on a tour boat. Green Island, part of the offshore seabird sanctuary in the Witless Bay Ecological Reserve, lies off the north point of Mobile Bay and, during the summer, puffins, murres, cormorants, kittiwakes and other gull species, terns, and a variety of other seabirds can be seen in the bay. Along Mobile River, at Mobile First Pond and Mobile Big Pond, all within hiking distance of the community, moose, caribou, fox, beaver, rabbits, otters, muskrats, mink, owls, eagles, ospreys, hawks, loons, ducks, Canada geese, ruffed grouse, snipe, partridge, and a host of songbirds can be spotted. 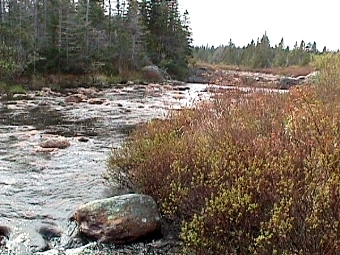 The Avalon Wilderness Reserve borders the western end of Mobile Big Pond and is a popular destination for hunters, fishers, and wilderness adventurers. 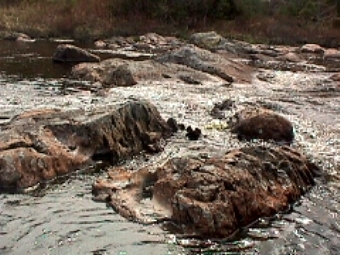 The waters flowing into Mobile Bay are inhabited by brook trout, brown trout, Atlantic salmon, American eels, threespine sticklebacks, and a small population of Arctic char. Blueberries, partridgeberries, bakeapples, cranberries, and other edible berries can be picked on the hills around Mobile. Detailed descriptions of some of the flora and fauna of the area can be found at "Two Dozen and Ten Tales of the East Coast Trail". Mobile Central High School, rebuilt in 2008, has a population of about 274 students (grades 7 to 12) and a staff of about 23. Mobile Central High School is located at the intersection of Highway 10 and Riverhead Road on the north bank of Mobile River. Mobile High serves seven communities from Bay Bulls to Bauline. Part of the Avalon East School Board system, Mobile High enrolls students who attended St. Bernard's Primary School (kindergarten to grade 6) in Witless Bay and schools elsewhere. Contact the Mobile Central High School Office at phone 334-2525 or fax 334-2078. 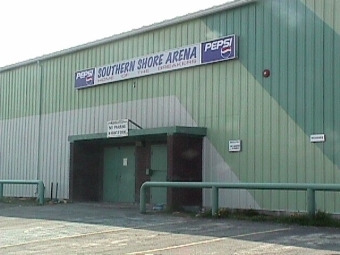 The Southern Shore Arena provides an indoor ice surface for hockey, figure skating, curling, and Sunday general skating from late September until early April, and a venue for circuses, rallies, concerts, and other events in summer, for the whole Southern Shore from Fermeuse to Bay Bulls. The Southern Shore Arena is a non-profit organization run by a volunteer Board of Directors. The Arena is located on Highway 10 on the hill (locally known as Frog Marsh) at the northern boundary of Mobile. It is the home of the Southern Shore Breakers Hockey Club, repeat winners of Newfoundland's senior hockey Herder Memorial Trophy. Contact Ken Williams, Arena Manager, at the Arena Office, P. O. Box 86, Bay Bulls, NL. A0A 1C0 or phone 334-2288 or fax 334-2288 or phone Ken at home, 334-3456. See photo of the Southern Shore Arena. The Mobile Pool and Playground is located at the end of Riverhead Road, off Highway 10 on the north bank of Mobile River. The landscaped, fenced, concrete pool is fed by cool river water and opened for 6 - 8 weeks in summer (usually opens first or second week in July) with a certified lifeguard on duty. 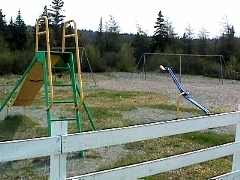 The playground is supervised by students during the summer and has swings, slide, teeter-totter, monkey bars, and organized activities. The Mobile Pool and Playground is managed and administered by the Mobile Recreation Committee Inc. on a volunteer basis. See photo of the Pool and Playground. The Fitness Hutch is a physical fitness center with a variety of exercise equipment. Daily, monthly, quarterly, and yearly membership rates are available. The Fitness Hutch is located on Highway 10 near the top of the hill on the south side of the Mobile River valley downstairs from T&C Sales/Rental Hutch. Contact Terry Hutchings or Clare Brazil, P. O. Box 72, Mobile, NL. A0A 3A0 or phone 334-2952 or fax 334-2971. Captain's Table Restaurantserves the best traditional Newfoundland dishes, fish and chips, and fast take-out. 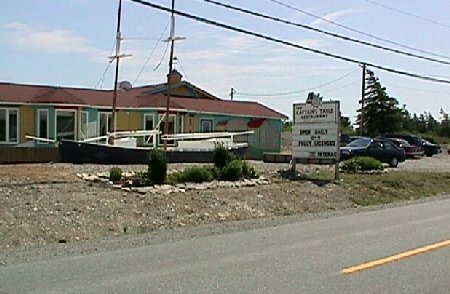 Captain's Table Restaurant is owned and operated by the Jackman family. Captain's Table Restaurant is located on Highway 10 on the hill (locally known as Frog Marsh) at the northern boundary of Mobile, across the road from the arena. Open 7 days a week during the warmest months, 11:00 a. m. to 9:00 p. m. (appetizer menu only, 8:30 - 9:00 p. m.). Contact Phyllis Jackman, P. O. Box 49, Mobile, NL. A0A 3A0 or phone 334-2278. See photo of the Captain's Table Restaurant. Phoenix U-Store provides heated dry storage for a variety of goods including automobiles. Phoenix U-Store is located on Highway 10 at the top of the hill (locally known as Frog Marsh) near the northern boundary of Mobile, just south from the arena. Contact Phoenix U-Store by phone at 368-1919. Ken Dillon, Autobody Mechanic, does complete automotive body repairs, collision repairs, and painting services. Ken Dillon has over 25 years of experience in autobody repairs and has his garage and painting studio located on Highway 10 part way up the hill on the south side of the Mobile River valley. Contact Ken Dillon, P. O. Box 70, Mobile, NL. A0A 3A0 or phone 334-2507 or 685-2508. LCM Construction provides concrete forms and footings for commercial and residential construction. LCM Construction is based at Bobby Kennedy's house, on the east side of Highway 10, part way up the hill on the north side of the Mobile River valley. Contact LCM Construction at P. O. Box 36, Mobile, NL. A0A 3A0 or phone Bobby Kennedy at 334-2054 or phone Mike Kennedy at 334-3750. Maher's Sawmill, operated since 1912, cuts, saws, and planes local lumber and timber. Three generations of Mahers specializing in finished lumber can be found on Mill Road, just off Highway 10 near the top of the hill on the south side of the Mobile River valley. Contact Kevin Maher at 334-2913 or Francis Maher at 334-2756. 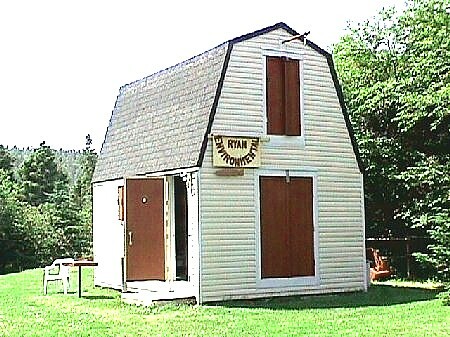 See photo of Maher's Sawmill. Molly Bawn Whale and Puffin Tours takes visitors out of Mobile Bay for 1 1/2 hour boating tours of the Witless Bay Ecological Reserve throughout the day from May until September and any time upon request. The Molly Bawn II is a 35 foot, Coast Guard Approved boat with a heated cabin and washroom. Travellers can expect to see whales, icebergs, and a grand abundance of seabirds. Molly Bawn Whale and Puffin Tours can also provide private parties, extended tours, on-shore barbequing after the tours, and Newfoundland music. 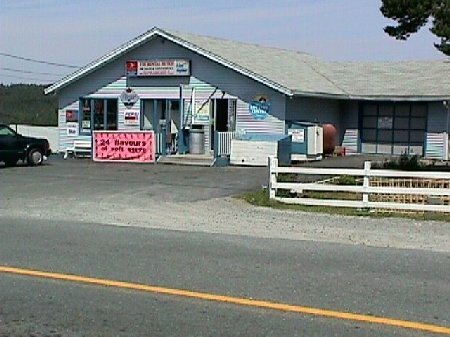 Molly Bawn Great Island Whale and Puffin Tours has a ticket kiosk located on Highway 10 by the Mobile River. Contact the Molly Bawn crew by mail at 91 Waterford Bridge Rd., St. John's, NL A1E 1C7 or email at info@mollybawn.com or by phone at (709) 334-2621 or (709) 691-0047 or after hours at (709) 334-3759. Newfoundland Power has operated a 9.5 megawatt hydro-electric generating plant at the mouth of the Mobile River on Highway 10 since 1951. Water is drawn from Mobile First Pond through a penstock under Highway 10 to the turbine in the gray building at the intersection of Highway 10 and Gus O'Reilly's Road. Newfoundland Power is a regulated, investor (Fortis Inc.) owned, electric utility. Contact the Newfoundland Power corporate office at 55 Kenmount Road, P. O. Box 8910, St. John's, NL. A1B 3P6 or phone 737-5600. Alternatively, call toll free customer inquiry at 1-800-663-2802 or power outages/emergencies (24 hr.) at 1-800-474-5711. R & L Construction provides concrete forms and footings for commercial and residential construction. R & L Construction is based at Loyola Hutching's house on The Track, off Highway 10, part way up the hill on the north side of the Mobile River valley. Contact R & L Construction at P. O. Box 31, Mobile, NL. A0A 3A0 or phone Loyola Hutchings at 334-2334. 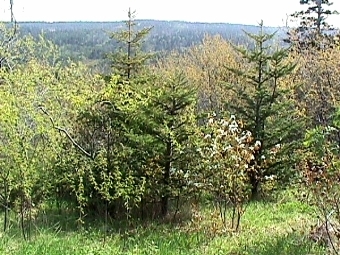 Ryan Environmental, owned and operated by Pat Ryan, supplies consulting services related to environmental biology. Ryan Environmental has over 25 years of experience in environmental assessment, environmental development, fisheries stock assessment, environmental research, information presentation, organizational leadership, and guide services. Ryan Environmental is located part way up Riverhead Road, off Highway 10 on the north bank of Mobile River. Contact Ryan Environmental at P. O. Box 58, Mobile, NL. 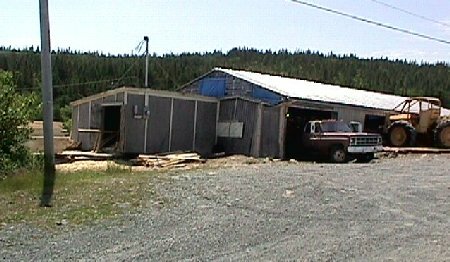 A0A 3A0 or phone 334-2962 or email patrickr@mun.ca.See photo of Headquarters of Ryan Environmental. Sharpe's Farm is owned and operated by Russell Sharpe. The farm is located on Highway 10 on the hill (locally known as Frog Marsh) at the northern boundary of Mobile, across the road from the arena and next to the Captain's Table Restaurant. Sharpe's Farm sells fresh strawberries in season from the last of July until early September and fresh vegetables in the fall. Contact Russell Sharpe at General Delivery, Witless Bay, NL. A0A 4K0 or phone 334-3278 or fax 334-3559. T&C Sales/Rental Hutch operates a convenience store with a wide variety of goods, an equipment rental agency, and the Fitness Hutch. T&C Sales/Rental Hutch provides storage space, fax/copy services, and a complete range of rental equipment for construction, repairs, parties, etc. T&C Sales/Rental Hutch is located on Highway 10 near the top of the hill on the south side of the Mobile River valley. Contact Terry Hutchings or Clare Brazil, P. O. Box 72, Mobile, NL. A0A 3A0 or phone 334-2952 or fax 334-2971. See photo of T&C Sales Convenience Store and Rental Hutch. The Southern Shore Arena on Highway 10. Mobile Pool and Playground, Riverhead Road. The Playground on Riverhead Road. High view of the beach from the south. Mobile Valley from the north. Mobile Bay on a calm day in May. Kelp on the beach in May. 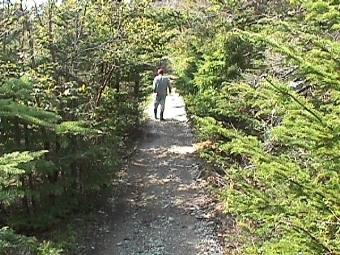 A Mobile hiking trail in May. Mobile trees in May blossom. T&C Sales Convenience Store and Rental Hutch on Highway 10. Maher's Sawmill on Mill Road. Captain's Table Restaurant on Highway 10. Headquarters of Ryan Environmental (consultants in environmental biology) on Riverhead Road. Pat Ryan (research and construction), Ryan Environmental, Mobile. This page constructed with Netscape Composer and GIF Construction Set 32. GIF images and animations from Ryan Environmental, Netscape, and Xoom.com. If you have comments or suggestions about the Mobile home page, please email the webmaster at: patrickr@mun.ca.